Lighting set up: A Canon 550EX through a 10 degree grid spot about 20 feet away from the cue ball, to camera right, firing straight down the table. The grid spot confines the flash's output into a tight circle. It's generally used to provide a hard light (one with sharply defined shadows), with dramatic falloff to blackness. But, if look at the photo, the the light falloff from the right edge of photo to the left edge, isn't all that great. There are sharp shadows, but the pool cure isn't blown out compared to the shooter's face. That's because the light is so far away. In the previous entry in the Single Speed Light Challenge, I discussed the inverse square law of light: light intensity decreases by the square of the distance increase from the light source. In that photo, I used that law to render a background filled with bookcases as featureless black. Here, I use it to get relatively even (not completely even) exposure across the back half of the pool table with a single, hard light. It works because the distance from the light to the cue ball is about 20 feet. 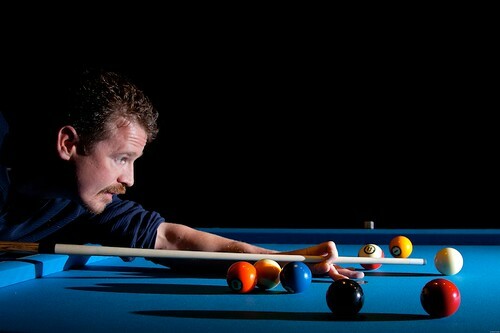 The distance from the cue ball to the face is about 24 feet. It works out to about a half stop of light falloff between the two. If I could have moved the flash even further back, I could have reduced the falloff even more. Where the grid helps is by keeping the flash off the background, allowing it to go dramatically black.